how can you live if you are not connected? I heard the evening news tonight mention the rescue of two boys from a swollen creek. I wonder aloud if they were wearing shoes when they were rescued. I had ridden home in the middle of the storms that would create that news item. It had all started well but by the time I decided to stop I wasn’t concerned about getting any wetter, it was more because I can’t see more than a couple of metres in front of me. So I stop and take shelter as the sound of the falling water engulfs me. On my right the smell of mangroves and mud rises from the falling water. On my left a spontaneous piece of performance art (or perhaps performance poetry?) arises as cyclists braver than I come in out of the rain. The involuntary gasp that arises from their bodies as they ride through the column of water falling from the deck of the freeway above us can be seen so clearly that despite the rain you can hear it in the space behind your eyes. 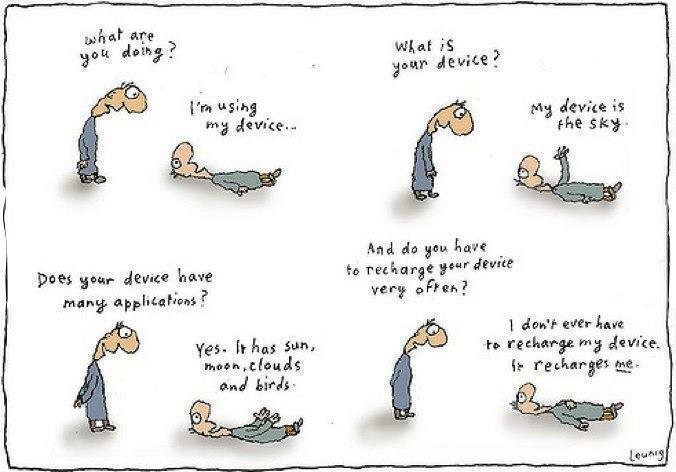 Standing there not looking at Facebook reminds me of the Michael Leunig cartoon that someone recently posted. (I hope he does not mind me sharing it here with you). It was nice but I recall it says nothing about thunderstorms – only the sun and clouds. Later, after I have ridden again (in what turned out not to be a break in the rain) a dry old man standing by the river, clearly wiser than I as he has not left the shelter of the next bridge , laughs out loud as the same gasp arises from me. After riding in the rain it is drawn from me not because the falling water is cold, but because despite its huge volume the water has stolen the heat of the day from the road above and runs warm down my back and into my already sodden shoes. After sharing in his laughter as we watch others come in from the rain as I had done, I chance my judgement and ride again. This time up from the river and beside the freeway. The steep climb leaves me smiling broadly. Do all those people sitting dry in their cars just metres away know what they are missing? Have they looked up to see the rainbow racing across the sky? Further along the quiet gurgle of the creek that crawls along the storm water drain has become a swollen monster that consumes footbridges and footpaths alike. I stop and take a photo alongside the children who have crossed the road with their mothers to see the rising waters. Forced on to the road now I am alongside those sitting dry in their cars – heading upstream but following the flow of the traffic. Windows tightly shut I do not need my ears to know every radio is discharging regular road reports to help drivers avoid the inconvenience created by the gathering waters. Not me. I turn off the road back towards the higher sections of the path and am finally able to cross the creek. On the other side of the bridge I see two pairs of shoes by the side of the road. It is the pair of purple football boots with Bronco’s socks that I can see most clearly. They look to have been discarded, but not lost. Left there in a hurry by boys (almost young men I imagine) headed towards the creek to connect with its rising power. It is a stupid and dangerous thing to do and I hope they will return soon for their shoes. Beside me now the long grass and reeds still lie flat under the weight of the falling water while branches, previously held high above the path, hang low and threaten to unsaddle me. The dry gullies have become small streams that discharge debris over the well-known path that I feel like I am now riding for the first time. The light of the rainbow has been replaced by that particular shade of “after-the-storm green” that seems to exist only to amplify the sound of the water that creates it. The water collected in my helmet chooses that moment to draw as it falls a path to the tip of my nose and is driven by the wind into my mouth. I gasp and spray the water back into the air. In that instant, for the first time in a very long time, I feel recharged. I feel that I am connected. I wonder how can you live if you are not? Thanks Barb. And thanks for posting your first comment on my blog! What an unexpected ride home! glorious! What a thrilling ride Paul. You write in the spirit of the Leunig cartoon that I’m so glad you’ve re-purposed – I love it. Connecting to nature and the elemental forces as you describe, as well as to each other via all our electronic gizmos is a dazzling way to live. Your writing had me on the edge of my seat with the immediacy with which it conveyed your almost ecstatic experience in the thunderstorm. Wow! Thanks Susie. I think the Leunig cartoon might have re-purposed me! ahh – is that ‘the feeling’? I think it is! The feeling you chase in Aikido of being centered, relaxed, aware and connected. Now if I can only find it and stay dry!